Beauty really shines from this lovely 3-bedroom 2 bathrooms desert home. The entrance greets you in the front yard with a nice sitting area and a desert landscape layout with Cypress and Oleander Trees, plenty of cement spacing with even a basketball hoop for those sports enthusiasts! Inside, you have a formal living room then a family room with a beautiful brick lay fireplace for those winter nights, and open to the kitchen with an eating area, lots of cabinet space, stainless steel appliances, and granite counter tops. The carpeted bedrooms each have ceiling fans and plenty closet spacing, and a full bathroom with granite counters, the master gives you a walk-in closet, full bathroom with granite counters and a view to the big backyard, which gives you the peaceful and elegant covered patio with recessed lighting and ceiling fans to enjoy the beautiful desert and mountain views. YOU HAVE TOYS?? LOOK NO FURTHER!! The backyard space is PERFECT for the vast variety of toys and vehicles that you may have, including a RV entrance too! 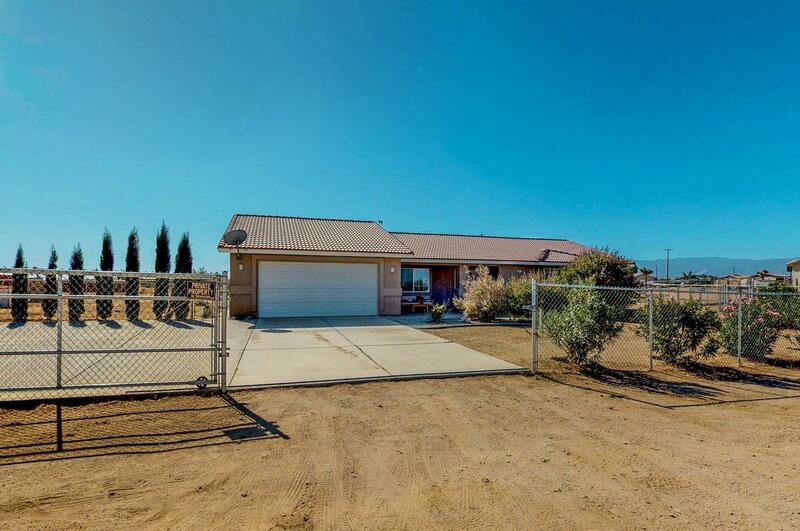 This desert home is ready for the new growing family ready to take the desert by storm! Directions: 15 N Exit Main St And Go West, Turns Into Phelan Rd, Turn Right On Caughlin Rd, Right On Wadi Dr, Right On 7th St Piq On The Left.